We all have to deal with far too much email, whether we like it or not. If your job involves email then you receive even more of it, and we doubt that too many people enjoy dealing with it on iOS, even with some of the excellent email apps that have appeared over the last couple of years. Most of us want to spend as little time on email as possible, which means a get in, get out-attitude to our inboxes. With that in mind wouldn’t it make sense to deal with email in a way that didn’t mean we had to launch an app at all? How about being able to quickly triage emails without even having to unlock our iPhones or iPads? Sounds good right? Why yes. Yes it does. This is exactly why eMail Widget came into being. 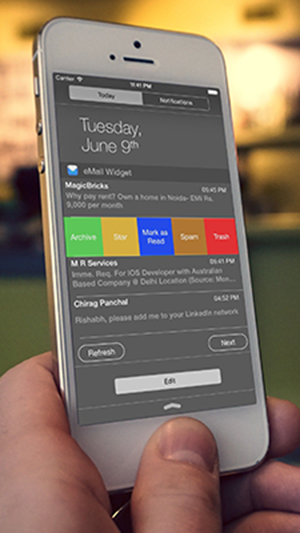 This $1.99 app’s sole purpose is to get its widget into your Notification Center screen and once that’s done, it sets about making it easier for you to work with your inbox. Once installed you have to give your Gmail or Google Apps credentials to the app so that it can log in and access your emails, and while those two options are the only ones available right now, we’re told that more are on their way. Once up and running you’ll see your inbox in the Notification Center, and if you have everything configured just so, your Lock screen too. You can do more than just look at your email though. With a swipe you can archive, mark as read, delete and even star emails without ever having to open an app. With the app being a universal fit for all iOS devices, once purchased, it will be accessible for free on any other devices running that same Apple ID. If you receive a lot of email and need a way to easily – and above all – quickly triage messages, then eMail Widget may be just the tool you need. It only costs $1.99 too, so why not give it a try and find out for yourself?